Tweed fabric is a kind of rough woolen fabric and suitable for outerwear. Tweed fabric is a kind of rough woolen fabric, with a special style of patterns and designs. The appearance characteristic is “variety”. It is a classic fabric for menswear. Regarding the origin of its name “tweed”, there are many different versions of the story. One of the most widespread stories is that this fabric from Scotland is known locally as “tweel” and that is the Scottish name for “twill”. Around 1830, a British businessman learned of this particular fabric in a letter, but mistakenly recognized the hand-written “tweel” as “tweed”, thinking that it was named after the Tweed River, which flows through the Scottish Borders textile area. This name was accepted by the United Kingdom over time and spread to the whole world. Tweed adopts plain weave and twill weave, using raw materials such as full wool, wool blend viscose, wool blend polyester or acrylic, or other synthetic fibers. It is based on twills and sometimes varies with cross twills, plain twill, overcheck twills, herringbone twills, net-shaped twills, tartan tweeds, plaid tweeds and etc. It shows a rough style. Usually, the yarn is thick, making tweed fabric flat and stiff. This kind of fabric has very good thermal insulation qualities, with the certain thickness of knitting wool. It is a good fabric for men and women’s outerwear. Most tweeds are made of dyed yarns, but still, some are dyed after being woven. Due to the different quality of raw materials, yarn size and process, the tweeds can have different styles. One type is that covered with felted linter, and the surface is smooth and even with a tight texture. The second type is that covered with fluff, and the hand feel is soft and slightly elastic. The third one has clear patterns on the surface with bright colors. The structure is loose but not bad. In fact, the high, medium and low grades of tweeds mainly depend on the raw materials and yarn count. Now, tweed is widely used for women, such as coats, suits, dresses, and etc. In the market, there are many kinds of Tweeds, such as the common Homespun and Harris Tweed. Homespun often uses Mule or hand spinning, so it has the name Homespun. 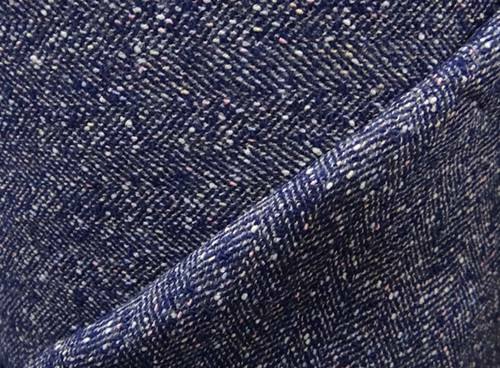 The surface of this kind tweed is evenly distributed with various colors. The surface has obvious scattered colorful spots. Harris tweed uses raw sheep shearing as raw material, and then goes through the process of hand spinning, manufactured, and cleared. It is a grainy tweed, with a loose structure and textured weave. It is rough and stiff. Chanel was the first to apply tweed to women’s clothing. It can be said that Chanel created a clothing market for tweeds. Because of the special tweed weaving method, it is waterproof in addition to the resistance to wind and coldness. Tweed suit is also a classic collection of Chanel. With light luxury design and special style, it is never out of fashion. Chanel suit is simple and elegant. When the tweed and the suit met each other, it became a classic, never falling behind. Many people also fell in love with Chanel from tweeds. Tweed suits have always been classic no matter what color it is, eliminating the trouble of costume matching. Different raw materials, yarns as well as techniques in finishing can result in a wide range of fabrics in different weights, patterns, and styles. When buying tweed, it is important to have a look at the stability of the width and weight of the fabric in order to avoid the purchase of inferior fabrics. In this point, UNITEX provides color cards of tweed wool fabrics, clearly marking the info. The clarity of the pattern and quality are also guaranteed. This entry was posted in blog and tagged Tweed.